The building was inspired by the surrounding mountain range. AMHERST, Mass. 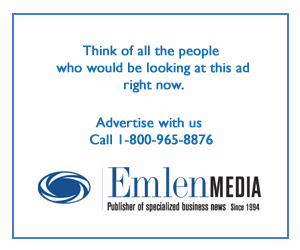 — To the layperson, the term “net-zero” might sound like something is amiss with one’s business. 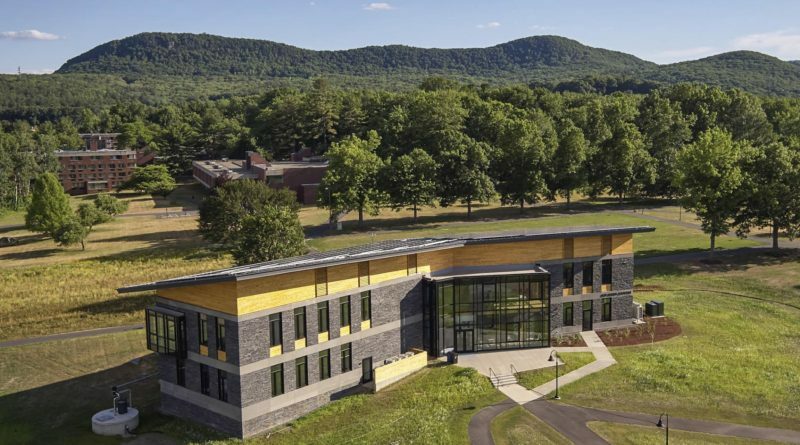 These days, if you’re in the business of building green-themed colleges, it’s the pinnacle of achievement. One such facility is the new R.W. Kern Center on the Hampshire College campus in Amherst, Mass. Designed by Cambridge-based firm Bruner/Cott & Associates, the 17,000-square-foot R.W. 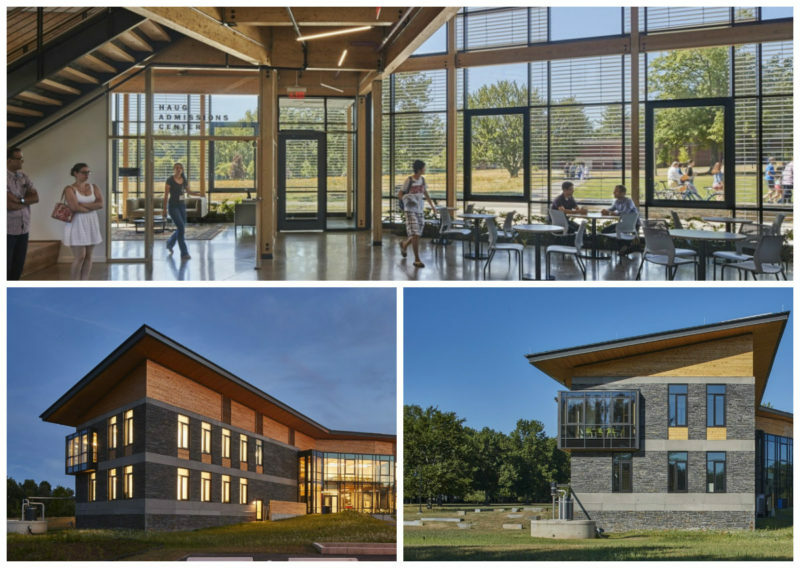 Kern Center has been certified as a Living Building by the International Living Future Institute (ILFI). Hampshire alumnus Jonathan Wright, founder and senior advisor of Wright Builders, Inc., served as construction manager. The building is now part of a roster that includes just 16 other Living Buildings presently certified and is remarkable as the world’s largest such Living Certified higher-education project. The center cost $10.4 million, including $7.4 million in construction and was funded entirely by donors, most notably the family of alumnus William “Bill” Kern, who also gifted their name to the structure. The center unfolded in stages, beginning with a multifunctional welcome center that came online in April 2016. Boasting a central double-height, glass-pavilion atrium that houses a café, lounge and gallery, the structure showcases the surrounding natural environs with impressive views. Admissions and financial aid offices are sequestered in two stone-clad wings. Classrooms boast views of a nearby amphitheater, and rainwater harvesting reservoirs and a solar farm, as well as an orchard and wildflower meadow, thrive throughout the campus. Among the features that underscore the building’s energy efficiency are its rooftop solar canopy that generates electricity and a rainwater harvesting system that supplies drinking water for the building. Moreover, the project’s rainwater collection and treatment systems are complemented by composting toilets and a greywater-infiltration system. The result is net-zero water usage. Likewise, the photo-voltaic roof generates approximately 17 percent more energy than the building actually uses.